This week Megan Witty, event organiser of the Owls of Bath sculpture trail, answers our 10 questions. Book you read? The last book I read, and have to keep re-reading as there is so much to take in, was The Silk Roads by Peter Frankopan. It’s basically the history of the world and charts the rise and falls of empires from 4,000 BC to today. It should be compulsory reading as it redresses our usual Eurocentric focus to the original centre of globalisation in the Middle East and central Asia. While we were living in huts and being invaded by the Vikings, vast cities along the Silk Route were opening universities, computing the radius of the earth and writing books on medicine that were used in hospitals across Europe for over 500 years. Who knew the Chinese were the first to use loo paper and that the Huns wore robes made of field mice and ate raw meat “partially warmed by being placed between their thighs”. Fascinating! Music you bought/downloaded? I mainly listen to music on the radio when I’m in the kitchen and driving along in the car. Concert or play you went to? The Railway Children at the Mission Theatre. My husband, Chris Witty, was Jim (the ‘Hound in the Red Jersey’) in the original film with Jenny Agutter and the theatre’s artistic director invited us to meet the cast and see the production, which was wonderful. Sporting event you attended? Brighton v Maidstone hockey game. My son Alex, who is studying Product Design at Brighton University, is the goalkeeper for Brighton & Hove, so we go down whenever we can to watch a game, play the ‘penny falls’ on Brighton Pier and take him out for a slap-up meal. If anyone would like to offer a work placement to a hockey-playing designer/inventor next year, please let me know! Holiday you went on? I used to travel all over the world as a producer/director for the BBC Natural History Unit and love travelling. However, my last holiday was two years ago when I managed to sneak in a week in Barcelona between projects. Now that the ‘parliament’ of owls has finally flown the nest, I’m dreaming of white sand, blue sea and palm trees and hope to peg out on a tropical beach sometime before Christmas. Restaurant you ate in? The new Koffmann & Mr White’s at the Abbey Hotel in Bath. Delicious food, lovely wines and a great atmosphere. I met Mr Koffmann at the launch party this week, which was a great evening, complete with fire dancers and very tasty canapés! Thing that annoyed you? Having spent an exhausting day at the World Travel Market in London last week, followed by a very enjoyable private view of Bath artist Emma Rose’s exhibition in Shepherd’s Market in Mayfair, I rushed to Waterloo to get the last train back, only to find it had been cancelled. I then had to make a speedy trek across town to Paddington and only just caught the last train home. Thing that made you laugh out loud? When our greedy labrador Hector got his head stuck in a box of dog biscuits and was blindly running around the house with the box on his head until he ran into a door and fell over! Piece of good advice you were given? ‘Never work with children and animals’. I’m very glad I ignored this advice, as I spent many fantastic years at Thames TV in London and the BBC in Bristol filming children and animals in remote parts of the world. Some of the memories will stay with me forever, from taking the daughter of a Jersey zoo-keeper to Madagascar to meet her favourite species of lemur, to filming in the Bornean jungle on Christmas Day with a girl who lived with wild orangutans, and taking a young blind girl to meet the wild dolphins of Monkey Mia in Australia. They seemed to sense she was special and swam straight over to her, rubbing their bodies against her legs and offering her pieces of seaweed as a gift. The joy and excitement on her face was just wonderful. Megan Witty was born in Australia but grew up on the Kings Road in London. She worked for Thames TV for 13 years, followed by the BBC Natural History Unit for six years. 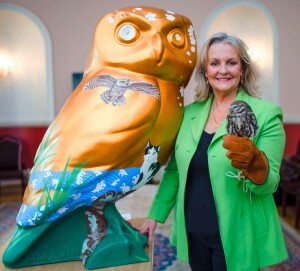 She came to live in Bath 12 years ago, where she co-organised the King Bladud’s Pigs sculpture trail in 2008, the Lions of Bath in 2010, Swans of Wells in 2012 and this summer’s Owls of Bath sculpture trail, raising more than £400,000 for local charities. She has organised the popular ’24 Hours in Bristol’ photographic competition for the past five years and project manages a wide range of events, from media launches to corporate events, promotional tours and international charity projects, recently taking four containers of animatronic dinosaurs to Bethlehem to create Palestine’s first Natural History Museum. But that’s another story…. Fancy a Hoot this Christmas? Owls of Bath books, posters, mugs, tea-t’owls and mini-owls make ideal Christmas presents and are available at discount prices. See https://minervasowls.org/shop or email megan@minervasowls.org for details.